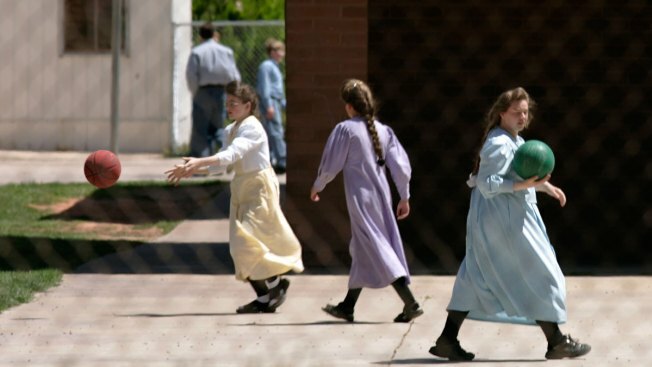 File image of girls sporting long prairie-style dresses, playing separately from the boys at a private school April 19, 2006 in Hildale, Utah. Leaders of the Fundamentalist Church of Jesus Christ of Latter Day Saints have kept a strict hold on every aspect of the FLDS life -- from the modest prairie-style clothes worn by members, to the time their kids stay in school and which house a family calls home. Two fundamentalist Mormon towns waged a two-decade campaign of systematic discrimination against non-church members, a federal jury found Monday, NBC News reported. The towns, Colorado City, Arizona, and Hildale, Utah, negotiated an agreement requiring them to pay $1.6 million in damages, according to the Department of Justice, which filed the civil rights lawsuit in 2012. As described in the department's 19-page complaint, town officials and U.S. Marshals operated as an instrument of the Fundamentalist Church of Latter Day Saints and its jailed polygamist leader, Warren Jeffs, who was sentenced in 2011 to life in prison for sexually assaulting two teenage girls, one of whom he'd taken as a bride. Last month, in a separate case, Jeff's two brothers and nine other church members were arrested on charges of food stamp fraud and money laundering.